I have used this since days of the palm pilot. It’s my go to app for medications. I use the pill identifier, dosing, and drug interactions most often. Very good specially for a free app. It’s OTC medication list is lacking and it doesn’t give the dialyzability of medications. Without the above issues it would have been perfect. This app would be great to look up drugs, except every single time I open it, this stupid notifications screen pops up with stories that I don’t care about, and I have to wait 10 seconds before I can actually use the app. 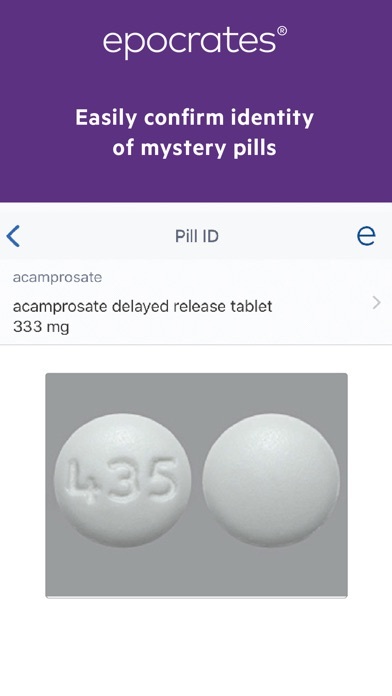 As a medical professional on the go, I don’t have time to wait forever to look at your ads every time I use a reference app. I recommend using an alternative. In fact, it is literally faster to get drug names using iPhones Safari web browser. Worthless. Please fix the notification screen that shows up on every start which is a pain and really slows down its use. Really annoying. What a shame! I love this app as an internal med physician, it is extremely useful. I wish there would be a section for medication overdoses. 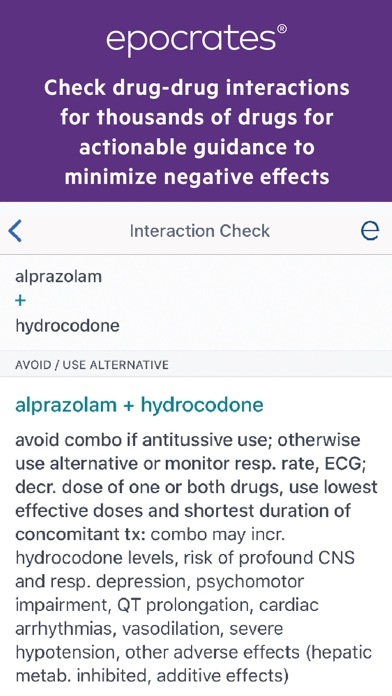 Just as we call the poison control and they tell us what to expect from a mild-moderate-severe overdose, I wish I could also rely on the app for similar info, not to substitute the poison control, but in addition, if I need to review common manifestations of overdose for further medical management. 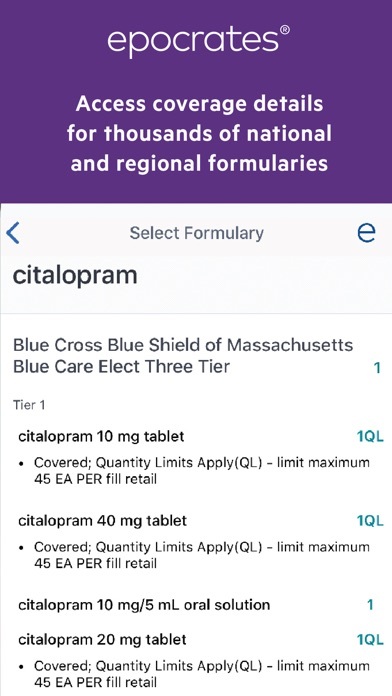 This is the fastest way to check Drug interactions that your patients are taking, as well as, informing them of some other possible problems; that way, YOU, the dentist/ oral surgeon NEVER prescribes a drug that will interact with your patients present medicines! Very important in this day and age ! THANK YOU EPOCRATES ! You are a great team of experts ! Is there a way a search bar could be added into the lab section? Like the medication and disease section? App was great until newest auto update version 18.12.1. Now every time I open the app, I can’t access anything because “content is being updated”. Updates used to happen in the background. Not happy with new update program. App is currently crashing every time I try to open it. Restarted phone to no avail. Currently using on iPhone XR. Hardly makes me want to continuing paying a premium for an app that doesn’t work. Please fix! I’ve had this app for years and it’s unparalleled when compared to other similar apps. I recommend it to all students with whom I have contact with; and I find most have anyway, and love it. 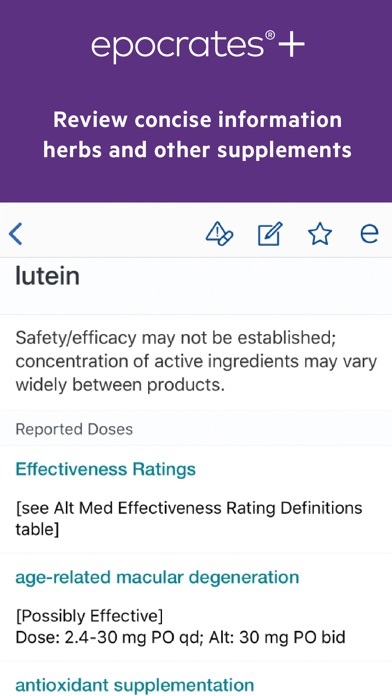 I use this app from time to time to look up medications I’m not familiar with for patients. I’m a therapist so I run into different medications at times and find it helpful to look them up. It is a quick source. However, it could use some adjustments to the look to make it easier to look up drugs. I have used this app for years, first when it was on a Palm Pilot. It has always been so useful. However in the last year it is less responsive, I can’t get the cursor to appear at the search line. I have to keep restarting it. The news keeps popping up when I’m in a hurry (during patient care). Loved you guys for years, please don’t let me down. 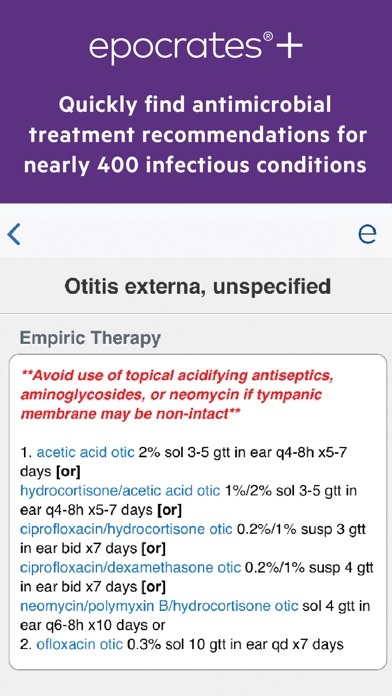 Very useful app for healthcare professionals; you get to have access to any drugs and diseases info at the fingertips! My frequncey tab is grayed out on my prescribing page for medications? I'm in pediatrics, so a frequncey tab is necessary 99% of the time. Perfect go to for up to date evidence based medical information. I use Epocrates every day. I find the ICD-10 feature extremely helpful. Simply could not function without Epocrates. The doctors and NPs use it to quickly look up drug doses, interactions, prices and side effects. This app makes a visible difference in how my practice BioBalance Health practices medicine. My wish list is for Epocrates to have all available drugs like Armour thyroid, and nature thyroid as well as list all available compounded drugs. A nice time saver would be to include the name phone and address of all medical doctors, hospitals and surgery centers in. Each city in the US. Since the blue book went away finding referral doctors is very difficult! My only complaint is it should have meds not available in the United States grayed out or ones that are no longer available. It wastes time picking the right med sometimes. Otherwise the ADR and SE are clearly listed and the drug drug interaction check is easy to use and fairly complete most of the time. I don’t know if a more useful free app on the iPhone that does everything it does. I would recommend it for everyone who wants or needs to be better informed. I use this all the time and helps me extremely. Love this app! However would like more ICU/CRITICAL care content such as the sepsis guidelines. Thanks! Using it for 10-15 years in practice. Indispensable help in day to management of patients. 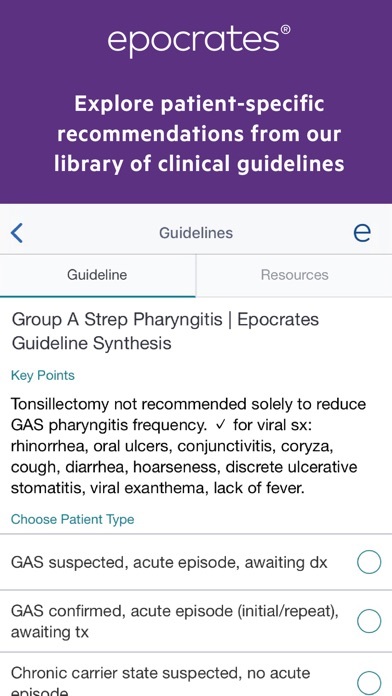 Having been in clinical medicine in the role of internist for 25+ years, I used this app on a daily basis. I found it most helpful to keep current with the new meds even before I was able to be detailed by the company reps. Once when I was hospitalized, I was able to do "mini " rounds with the nurse caring for me that day. She downloaded the app and informed several of her colleagues of the usefulness of the app. She found the section on pill identification the most beneficial section of the app. I’m a Holistic Health Practitioner with various licenses in alternative medicine. It’s imperative that I understand my clients state of health and unfortunately, for an American adult over 35 to be drug free is relatively nil. I am always looking up drugs clients write in their intakes as side effects are unavoidable and I have to know what’s an organic physiological occurrence and one that is secondary to drug intake. I don’t know if any other source so comprehensive and thorough as Epocrates. The consistent updating is super. Thank you team Epocrates. This is it. Perfect hand tool for residents, attending, medical students. One of few app that is worth to buy it. As a pharmacist, I use the free info all the time. I even recommend some parts to non-clinical friends. The dosing recommendations, interactions, adverse reactions, pill identification, pregnancy and lactation ratings, pharmacology are all very helpful and easy to access. Only thing I would change is the notifications that pop up when it opens about different articles. I would rather go to that tab myself when I’m ready. I would be more likely to read the articles that way. As it is I just delete them to remove the pop up. Stop with the pop ups. They are time consuming when you want to look up something quickly. Just keep it in the notifications. Otherwise keep up the good work. Concise, easy to use format, mobile, accurate. My preferred option for quick checks. I do use othe more encyclopaedic options, but Epocrates remains my first choice for most medication searches. As a retired family physician who volunteers at a clinic for uninsured I find Epocrates a valuable help. I run a drug drug interaction with this app on every patient. I started using it as a student and would not go to work without it. Best app on the market. It is a great tool for a busy physician in practice. But really don’t like the pop up messages. It just delays the process.